Me: Shall we go for a day ride on Sunday to DD Hills ? 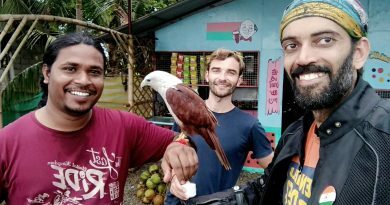 Few of my buddies from Road Thrill had been to Irakasandra, the place is awesome, lets go there as well ! ! ! ! Ganesh: Haan macha, lets go !!! I started from my home at 5.15am and reached Goregontepalya junction by 5.30am to see Ganesh had already reached there and was waiting for me. Ganesh: Macha, waiting for you from past half an hour. We planned to see the sunrise atop DD Hills, but I guess will see it on the road before reaching the hill top. Me: Let’s leave now bro, will watch the sunrise on the move. 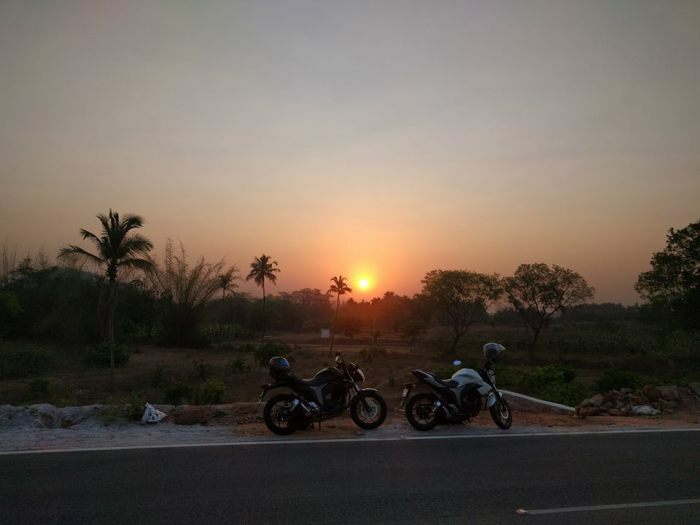 We headed straight on the NH4 (Tumkur Highway) and upon reaching Dabaspete (50kms from Bangalore) we exited the highway and took the right turn that lead to DD Hills. As we saw the glimpse of the first light, that yellow shining sun that started rising from the ground which filled the sky with mighty colors of red and splashed the clouds with endless rays of orange. It was bright and spectacular and invited us to stare, deep into the horizon. My “Warrior” #Sunrise Kiss #Nature……. Don’t Stay at Home, Get up and Ride, Chase the beautiful Sunrise !!! To give a brief introduction about the destination, Devarayanadurga Hills and is very commonly known as DD hills which is located in Tumkur District. It’s a small hill station with an altitude of 3900 feet above sea level and is surrounded forests and hilltops and the very famous Yoga Lakshmi Narasimha Temple located on the hill top and Bhoga Lakshmi Narasimha temples at the foothills are located there at DD hills. 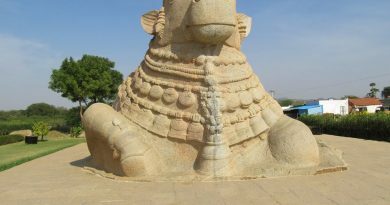 The Bhoga Lakshmi Narasimha Temple is located on the foothills and the Yoga Lakshmi Narasimha Temple is located on the hilltop. We first went to Yoga Lakshmi Narasimha Temple on the uphill and riding those twisties uphill is always an awesome ride. There are steps that also takes you to the hill-top temple, but as a biker I would always suggest to ride those twisties and corners. After reaching the top, we got to know that the temple opens only at 10.00am. We got some snacks from the shop there and meanwhile also taking some pics and watching the view of the mountains around and also at a troop of monkeys that were playing and jumping around while the visitors fed those monkeys. Its not only with Dogs I am playful with, Man’s Evolution from Monkey to Man. We: Thank you sir !!! We rode back down hill to the backside of Bhoga Lakshmi Narasimha temple and went straight to the view point. The view from there was amazing, rocky mountains all over, few coconut plantations and the Irakasandra water reservoir can also be seen from the cliff. And yes, the cliff is very dangerous and please be very careful especially when you take selfies and pose for those crazy pics along with your bikes. 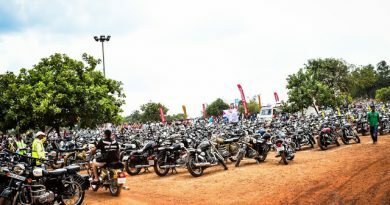 Another biking group “Big Bang Biker’s” was also here that day and we have Raghavendra from Big Bang Biker’s. Post few photo sessions here, we visited the temple and followed by Breakfast at the eatery near the temple. We then rode uphill again to visit Yoga Narasimha temple as it opens only at 10.00AM. You have to walk through over 100-150 steps to reach the temple from parking space. As we walked over those steps and at the middle there are few shops if you want to quench your thirst or to rest for a couple of minutes. Its true that Dogs are indeed a Man’s Best Friend. We continued climbing those steps to reach the hill-top temple. Post visiting the temple here, you can also trek / climb over those rocks besides the temple pond that leads you to a view point. Ganesh: What you say, shall we climb those rocks? Me: The climate is too hot buddy, you can trek to the top and I shall wait for you at the parking space and have some cold drinks and rest for a while. Ganesh: Ok Macha, I will trek and be back. He was back after a couple of minutes completing the trek and with all the excitement he said: There were hardly few steps that reached the top while he showed his pics from there. The view was nice indeed !! Those were the last few steps to reach the top most point at DD Hills. By now the seats of our bike were damn hot, so we poured some water on the seats to cool it down. From here, our next place to be visited was Irakasandra Water Reservoir which is 15-20kms away from the hills and took us approximately 30mins to reach there. Riding along side of the water body and we found some shady area to park our bikes. As we parked our bike and walked towards the reservoir, we said to each other, how this place went unexplored before. We settled on a small rock and watching all over the reservoir and wondering “How this reservoir is full with water when even though the temperature was around 38 degree Celsius. Ganesh: Had I knew swimming, I would have definitely dived into the water and would swim peacefully here !!! The Single Titanic Pose on a Rock in the middle of the reservoir !! We had a nice time clicking photos of each other and taking a hell lot of selfies. Ganesh went on and on clicking selfies and that’s why we call him “Selfie Ganesh” After all the photography we walked back to the place where our bikes were parked. Me: Maccha, we should come here once again, but we should reach here early morning, I hope the view would be more beautiful on an early morning. Ganesh: Yes we should definitely ride here some time again. The White and the Black Machines at Irakasandra Water Reservoir ! ! ! My Machine, My “Warrior” always ready to take those roads that were never taken and always ready to explore the places that were never seen ! ! ! We started our journey back to Bangalore and we stopped over for lunch at Hotel Kamadhenu on (NH4) and then rode back home. Thanks a lot Ganesh for yet another awesome road trip that added to our Travel Memoir. 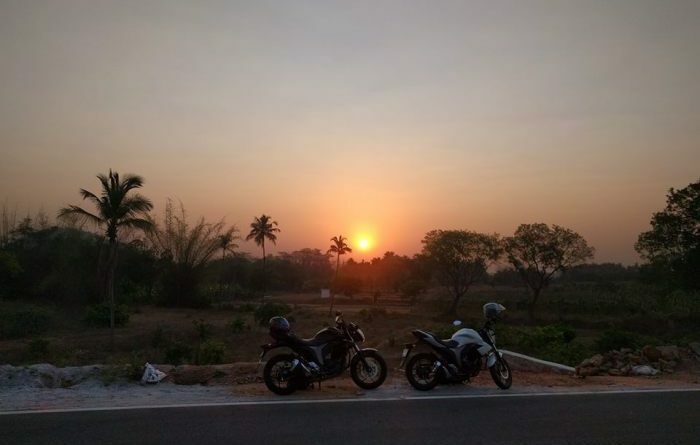 This was the story of our 175kms journey to Devarayanadurga Hills (DD Hills) and the unexplored Irakasandra Water Reservoir . Stay Tuned….!!! until I explore yet another destination, another place to be marked as “Completed” from my “To be Travelled List” and share my experience.